OK so you want to try lure fishing, here we have the list for the river lure fishing tackle you will need to get going. This list of fishing equipment for lure fishing is just to get you going and can be expanded in time to suit your needs. OK let’s get started, as with most methods the first things you will need are the rod, reel and line. For lure fishing the type of rod is controlled by the spicies of fish you are trying to catch and the type of water you are going to fish, but as a compromise get a rod which is 13 feet long (3.9m). The reel – you will want a fixed spool reel, this needs to be stronger than one used for float fishing as it has to cast heavier weights especially if you are going after big fish like pike. Try and get a reel with most if not all of these features, also see if you can get an extra spool for it (a lot of the new reels coming out today come with an extra spool) this makes it easy for you to have two setups ready to go. The line – because lure fishing can mean casting heavier weights than floating and you may hook up a larger fish, you need a higher breaking strain line up to 6Kg (12Lb) and 100m (110 Yards) of line will be enough to cover most conditions. Also the line you get needs to be a sinking line. You want to fill the reel to its maximum, you can do this by using old line for the backing or you can wind electrical tape round the spool. The reel needs to be filled to allow for the best casting. 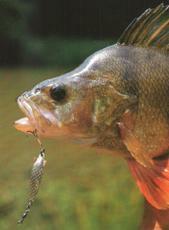 The Lures – There are many different types, shapes and sizes of lures. which one you use is controlled by what you are going to be fishing for. Lures range from a simple spinner to artificial fish 18″ long that can be made to dive in the water. With such a wide range of lures available you need to have an idea of what species of fish you are going after.